Ryuou Valley (龍王峡) is located Nikko, Tochigi. It is a valley made from the erosive action on Lava by Kinugawa river. It is about 3km long between Kinugawa Onsen and Kawaji Onsen. It is the art of huge rocks and many waterfalls. A hiking course are well prepared. Ryuo Valley is very popular spot for Koyo. 1. use Aizu-Kinugawa Line to Ryuokyo. Ryuou Valley is one of the most popular tourist spot in Kinugawa Onsen. It was made the erosive action on Lava by Kinugawa River. The lava came from the eruption that happened 22 million years ago. The entire valley is about 3km long between Kinugawa Onsen and Kawaji Onsen. There are many unique rocks and beautiful waterfalls. 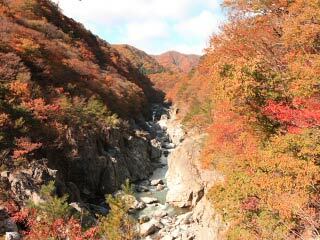 It is known as one of the best hiking valley during Autumn because it has great Koyo.